among global alternative energy leaders. ermany is solidifying its stature as a global leader in development and usage of alternative forms of energy. Major investments in green facilities and production of solar and other alternative energy-related projects are proliferating. Germany already employs more than 214,000 in renewable energy industries and that number continues to rise. Citi Group is investing €170 million (US$240 million) to build one of the world's "greenest" data centers in Frankfurt. The facility, Citi's largest outside the U.S., will save up to 25 percent on electrical energy consumption compared to conventional data centers. Citi officials say the site in Frankfurt Nieder-Eschbach was selected due to Germany's excellent electrical and data infrastructure, as well as its high security standards. The new facility will employ 40, including 20 new hires. It will provide IT services for Citi's operations in the EMEA region. Up to 99 percent of the building's electricity will be provided by alternative energy providers using wind, solar or hydroelectric power. Citi is building what it terms as one of the world's greenest data centers near Frankfurt. Dirk Schubert (left), head of Citi Realty Services for Germany, Austria and Switzerland, says the site won out over candidates in 52 other countries. The facility, which is aiming for LEED certification, will also conserve 46.5 million liters of water annually due to wastewater processing. Citi's new data center will employ a "living" roof and wall that will replace carbon dioxide with oxygen, offer enhanced insulation and lower heating costs, stabilize temperatures and reduce rainwater runoff. "The decision to build in Frankfurt was made from among sites of 52 other countries," says Dirk Schubert, head of Citi Realty Services for Germany, Austria and Switzerland. Schubert says Citi sees tackling global climate change as one of its responsibilities and has embarked on a major program to address the issue. "We know of the growth opportunities possible in the alternative energy and environmental technology market," Schubert says. "Our global $50-million environmental investment and financing plan announced by CEO Chuck Prince will target clean energy, technology, and carbon emissions, reducing activities over the next 10 years. "We have already spent more than $10 billion on investment and grants to alternative energy and emission reduction activities. The goal is to reduce CO2 emissions by 10 percent by 2011 across Citi's more than 14,500 global facilities." Schubert says the new facility, which is progressing as planned toward a May 2008 completion, will reduce CO2 emissions by up to 11,000 tons annually compared to a conventional data center. Wacker is expanding polysilicon capacity in Burghausen. is investing $73 million to build its first photovoltaic cell production plant in Bischofswerda. The company expects to complete the plant by the end of the first quarter of 2008 and ramp up its first line to a production capacity of 35 megawatts per year. ARISE has an ambitious plan to have eight lines installed at the site with a total production capacity of 360 megawatts per year. ARISE is the seventh manufacturer of photovoltaic cells to locate in the State of Saxony. A major industry player, Wacker, is expanding annual polysilicon production capacity at its Burghausen facility by 4,500 metric tons by the end of 2009. The project involves an investment of about €300 million ($428 million) and will create approximately 270 jobs. The expansion aims to meet soaring global demand for hyperpure polycrystalline silicon. The primary growth driver is the solar industry, which requires silicon for the manufacture of solar cells. Wacker forecasts continued solar market growth over the next four years and expects solar-sector polysilicon demand to increase at an annual double-digit rate. Wacker has been producing hyperpure polycrystalline silicon for the semiconductor industry at Burghausen for more than 50 years. 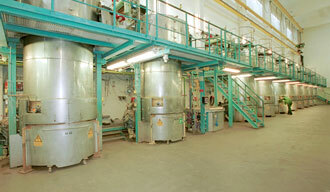 Dr. Peter-Alexander Wacker, the company's president and CEO, said he wants to triple polysilicon production capacity by the end of 2009. 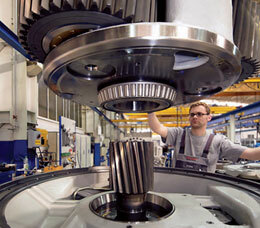 Bosch is expanding a subsidiary in Nuremberg to boost production of wind turbine gears. president of Wacker Polysilicon. "Extensive studies showed that Burghausen was the right choice, not only from an economic point of view, but also due to the speed of constructing the new plant there." Wacker officials also said a new labor agreement that included cost-saving measures and work time flexibility was another key to bringing the expansion to Burghausen. Bosch plans to establish a new manufacturing facility for large wind turbine gear units in Nuremberg for its subsidiary Bosch Rexroth. The company is also boosting production of components for gasoline direct injection. Bosch is investing €280 million ($396 million) in its Dieselstrsse and Zweibruckener plants by 2013, creating about 360 new jobs. Most of the investment, €180 million ($254 million), will establish the wind turbine gear facility. Bosch expects to begin delivery gear units by the beginning of 2009. Bosch estimated that the worldwide output of wind turbines installed in 2006 produces the power equivalent of more than 10 1,400-megawatt nuclear power stations. oogle's first development center in Germany is coming to Bavaria. The provider of the most-used search engine worldwide is combining the inauguration of its new branch office in Munich with more investments mainly involving engineering posts in the research and development sector and commercial positions. "We are proud of the commitment shown by one of the world's most important IT firms to Bavaria," commented Bavaria's Economics Minister Müller. "By taking this decision, Google is demonstrating its keen eye for the best conditions and most highly qualified skilled workers." Up to now, the Mountain View, Calif.-based company has had only one development office in Europe, in Zürich. A significant number of programmers will now be working in Munich on improving search functions and researching new products. At the opening ceremony in Munich, Nelson Mattos, Vice-President for Engineering, EMEA, at Google, said: "Munich is the home of many highly talented IT scientists and software engineers, which makes it an ideal site for us to develop innovations. 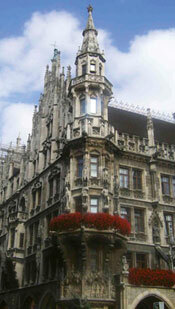 We are constantly on the look-out for talented candidates, especially now for Google in Munich."